GBP acted stronger against USD when the British Prime Minister, Theresa May won a no-confidence vote in the parliament. Also the UK’s consumer price inflation (CPI) declined. 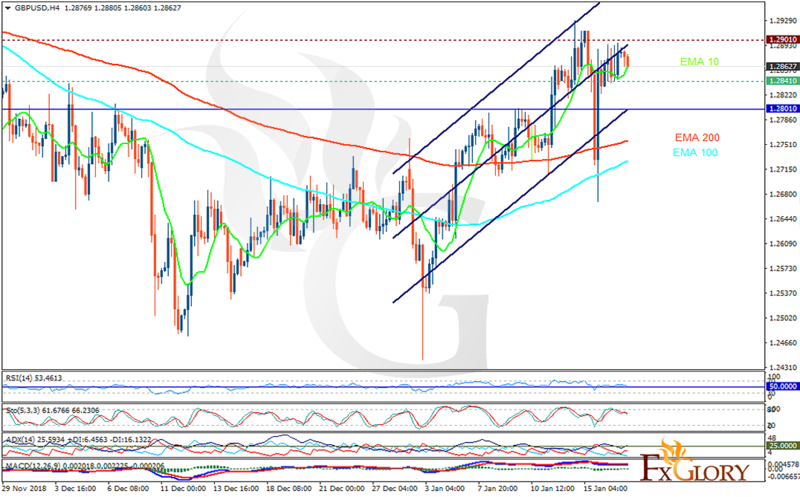 The support rests at 1.28410 with resistance at 1.29010 which both lines are above the weekly pivot point at 1.28010. The EMA of 10 is moving with a bullish bias in the ascendant channel and it is above the EMA of 200 and the EMA of 100. The RSI is falling towards the 50 level, the Stochastic is showing downward momentum and the MACD line is below the signal line in the negative territory. The ADX is showing sell signal. The support level breakthrough may push the pair down towards 1.2800; otherwise, GBPUSD will continue its bullish trend towards 1.295.